Political parties failed Thursday to agree to normalize the idle parliament as they clashed over how to handle allegations of real estate speculation by a former ruling party lawmaker. The floor leaders of the ruling Democratic Party (DP) and two opposition parties met twice earlier in the day to discuss the details of an extraordinary parliamentary session in February, but they failed to reach an agreement. The main opposition Liberty Korea Party (LKP) has been boycotting the assembly schedule since Jan. 24 to protest Moon’s appointment of a senior election watchdog official without a confirmation hearing and is demanding the official’s resignation. 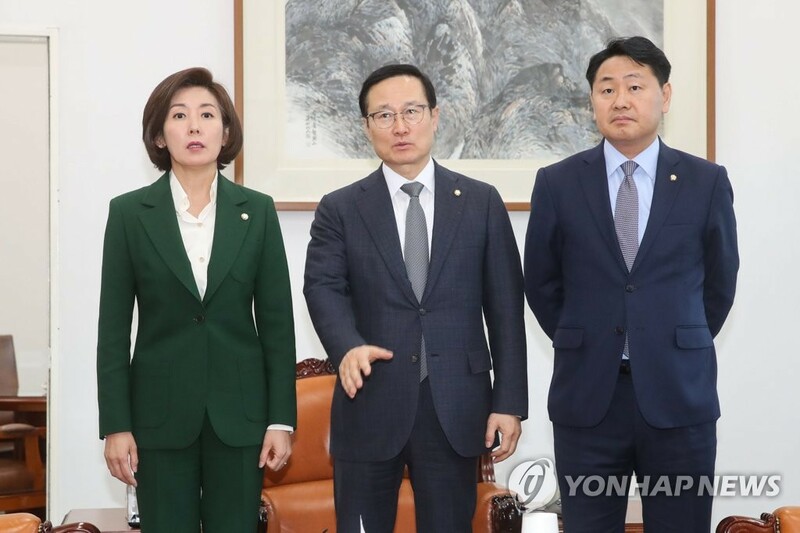 The parties mainly wrangled over the LKP’s demand for a parliamentary probe into alleged property speculation by Rep. Sohn Hye-won, a former DP lawmaker. Sohn is alleged to have mobilized her relatives and aides to buy properties in an old district of Mokpo, 410 kilometers southwest of Seoul, before authorities designated it as a cultural asset site. She has come under fire over allegations that she might have used inside information obtained while serving on the parliamentary culture committee to encourage her aides to buy assets. The ruling DP, which opposes a parliamentary probe into Sohn, instead proposed setting up a special parliamentary committee to take a broad look at the issue of conflicts of interests facing lawmakers. “It is regrettable that the opposition parties did not accept our proposal,” DP floor leader Hong Young-pyo told reporters. The LKP is also calling for a special counsel investigation into a former special investigator who has disclosed alleged power abuses and surveillance of civilians by the presidential office Cheong Wa Dae. By law, provisional sessions automatically convene in February, April and June. But the partisan wrangling puts at stake a set of bills on people’s livelihood and reforms. In January, the National Assembly sat idle as the parties wrangled over a raft of issues that ranged from electoral reform to the alleged real estate speculation by Rep. Sohn. The detention of South Gyeongsang Province Gov. Kim Kyoung-soo, a confidant of President Moon, was also a major source of political tension. Kim was sentenced to two years in prison for colluding with a power blogger to carry out an illicit cyber operation to sway public opinion in favor of Moon ahead of the 2017 presidential election.